Volunteering in Panama was never on my bucket list but I am so glad that I did it. I went to Panama for 4 weeks with my husband and while we were there, he was working during the day and so couldn't really leave the hotel we were staying in. We had evenings & weekends to explore plus the 1 week vacation he took. So, rather than being bored in the hotel room or exploring these cities without him, I decided to find something to keep me occupied. Yes, I could have spent my time shopping, exploring, visiting places etc but I decided I wanted to do something more worthwhile and meaningful. This is when volunteering in Panama seemed like the obvious choice. I looked online and found lots of different volunteer programs but each one required me to pay around $15 per day. I didn't (and still don't) understand why you would need to pay to volunteer. It kind of turns the whole thing into a business and I never really know where the money is going. I would rather give my time to help people than pay into a system that might have been good or bad for the people they were supposedly helping. So anyway, after contacting lots of people, I found Ana Gabriella who works for Hearts Cry Children's Ministry in Panama City. I sent her an email just asking if I could possibly volunteer for 2 weeks while I was visiting the city and she agreed. I had to fill out a form about my previous experience with children, my hobbies, a little bit about myself etc and we set up a starting date for my volunteer program. I had done some research online and originally asked Ana if I could help at Malambo which is one of the largest orphanages in Panama and hosts children deprived of parental rights, some orphans, others with medical needs and others with disabilities, until their family situation is resolved but it usually take years and children end up ageing out of the orphanage. I saw their website and read about how hard it was there for the children, especially for those with disabilities who most of the time are tied to their beds to keep them safe in one place or keep them from being harmed by others. After talking with Ana, she told me that this particular orphanage was a lot further away and would cost more in taxis but also would take more time getting to and from, but that there was an orphanage closer to Panama City that would appreciate some help too. So I went there. Ana invited me to have an informal interview with her at the Hearts Cry Children's Ministry office and to have a training session where she told me about the children, the organisation, the problems, what to expect etc. I am so glad that Ana took this time to talk to me and explain everything to me as I felt more informed and educated before being faced with the harsh reality of their lives in the system. Ana works for an organisation called Hearts Cry Children's Ministry which was set up by an American couple who couldn't have children naturally. One thing led to another and they ended up in Panama looking to adopt. They found it really hard to adopt the children in Panama, as they saw they were not getting out of orphanages and decided to do something about it, so set up HCCM. Since setting up, they have helped change a law which makes it easier for families to adopt in Panama. They help local orphanages but also opened a new orphanage in Colon called Casa Providencia, especially designed for children with disabilities without parental care, to receive the special care that they need. The work that these people are doing is incredible. They are trying to find "forever homes" for the children in the orphanages, while making their life as enjoyable as possible until that happens. Spending time there really made me think seriously about adoption and what I can do to help. So here I am, writing this article, hoping that it will inspire someone somewhere to consider Volunteering in Panama, send a donation online or even better, adopt one of the thousands of children in orphanages. And it isn't unique to Panama, there are children in orphanages all over the world, looking for someone to take them home and be their new family. So, after talking to Ana for a couple of hours, I was very nervous and apprehensive to visit the orphanage. It was my first time going into an orphanage and wasn't sure what to expect. The first day we went in to see the babies. There are around 12 babies under the age of 2 in 1 small room. Each baby has their own cot and they are organised in order of age. The youngest baby was only 4 months old which honestly broke my heart. When Ana gave me the training she told me not to pick up the children & cuddle them too much as they could get used to it, then when I go, they would miss that attention. The women working at the orphanage did a really good job of feeding the babies, looking after them, cleaning nappies, changing their clothes etc but what I did feel was lacking was love and attention. Some of the babies would cry and not get attended to. All they wanted was a cuddle and some love, which was rarely given to them. The other days I shared my time between the babies and the older kids, who ranged in age from 2 to 14. This orphanage was only meant for 0-6 year old kids, but there were 2 children there who were older. Both of which had downs syndrome and one of them had other disabilities too. They were allowed to stay here as they had spent their whole lives in this orphanage and didn't want to go to another one. Some of the kids warmed to me straight away crying "Tia, tia" which means aunty in Spanish. They were so happy and excited to see a new face and someone new to talk to & play with. The only problem was my lack of Spanish. I had never studied Spanish so only knew how to say Hola & Ciao. No joke. I was with children who would ask me questions, want to play games and talk to me and I couldn't reply! It was so frustrating, so I would urge anyone wanting to volunteer to make sure they have a basic level of Spanish to be able to communicate with the children. I just wanted to write down what a typical day volunteering in Panama could consist of. I got there at around 8am and either spent time with the babies or the children. Time with the babies was either spent feeding, changing nappies (which I didn't do but could have done if I wanted to!) and just generally keeping an eye on them. Making them laugh if they got upset. I did feel sorry for them as they didn't have much stimulation. They were kept in their cots unless they were being fed or changed. They had 1 toy each given to them to play with, but that was about all they did all day. Obviously for the younger babies who slept all day, this wasn't much of a problem, but I could tell that the older babies would get frustrated and bored with nothing to do all day. When I spent time with the older kids, we sometimes went to the park and played on the swings & climbing equipment. It was hard to keep all of the kids happy and split my time equally between them all. The older kids seemed quite happy keeping themselves occupied and it tended to be the younger kids who wanted my attention the most. I helped the staff while handing out food and then clearing it away, cleaning the floor, feeding the babies and generally keeping the kids from hitting each other. I also spent time with the kids in the lounge area where we would be silly together, watch TV and just relax. A lot of time was spent in the downstairs playroom where I observed the kids and tried to stop any fights & stealing of toys etc but also try to have fun with them. I must admit that I found it hard to communicate not only with the kids but also with the staff as they didn't speak English and I didn't speak Spanish. So I sometimes didn't quite know what they wanted me to do but apart from that I feel like I was a useful volunteer and tried my best to keep everyone happy. The kids had lunch at around 12 then went up to bed for a nap until 2. They then came back downstairs and we would sit and watch TV until it was time to play again. I didn't stay at the orphanage any longer than 5pm so I'm not sure what their evening routine is like. I was at the orphanage during the school holidays so there were some local school children (teenagers) who came to volunteer too. But also, this meant that I didn't see any teachers at the orphanage and I'm not sure if they ever get taught properly. My overall experience of volunteering in Panama was good. I was very apprehensive but actually the kids were very kind and fun to be with. There was a couple of things that made me slightly uncomfortable such as the lack of love, the basic & boring food they were given daily and the mixture of young children with the older children, as I found some of the older kids bullied the younger ones. But overall it was a great experience. It really made me question whether I would want to adopt but it also made me want to make a real difference in their lives. Even though it has been 2 months and I have yet to do anything productive for them, I think about them often and am still trying to figure out a way to help. Everyone talks about "raising awareness" but I don't think that is what needs to be done. Everyone knows that there are orphans all over the world, yet no one does anything about it. I would really urge anyone to volunteer in an orphanage next time they are away on vacation in a poor country. It will greatly impact your life, but also the lives of these children who get so excited to see new faces. Volunteering in Panama has been one of the best experiences of my life as it really opened my eyes to how people really live in these poor countries. 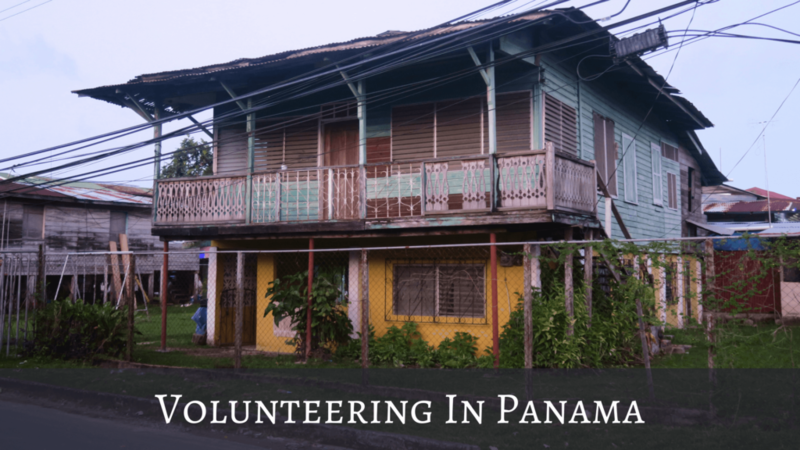 If you're considering volunteering in Panama, please contact Ana at Hearts Cry Children's Ministry as she will be able to help you with your questions. Plus, going through her, you aren't expected to pay $ per day like you are with other organisations. Thanks Rosie, as a former Peace Corps Volunteer and living in Panama, I can appreciate your feeling of doing something positive. Youth represent the future of any country…we need to be aware of their needs and problems. You honor me with your thoughts and dreams. Still want to work with children in need? Contact your local office of CASA, Court Appointed Special Advocate. CASA is in every state except one of the Dakotas. They represent children that are abused. Stay in touch. Hi Bob, thank you so much for taking the time to read my blog post and for leaving a comment. I greatly appreciate it! Yes, I would love to do more to help children. I will Google it tonight and see if I can find a way to help! Thanks again, Rosie.